hi there, how you doing this week? The adventure continues as we reveal page 6. I put it out to the community on various platforms asking what you would like me to blog about. This suggestion from FluteArmorGuy on Reddit came in. It’s actually a great question, what I’ll do is put my spin on the answer and then tell me what you think in the comments section below. Yes, it’s a comic book so good art is incredibly important, before we can come up with the art for the panels we need to know what will be in the panels. If we have beautiful inks and colours that don’t flow together in some coherent way, we’ll lose the reader and the reader won’t want to turn the page – or swipe/hit next for digital versions of the book. Not to mention that the artist wouldn’t know what to draw. A story can take many forms, it can be a novel in its own right – and those do pretty well, I mean let’s take two massive novels that have been turned into movies, if you look at either World War Z by Max Brooks or Ready Player One (*AFF) by Ernest Cline these are both books that have been turned into major Hollywood movies. If you look at either of these two books on Amazon then you’ll see other than the cover art these books are majority plain text. That isn’t to say that they couldn’t and aren’t somewhere as comic books at some point in time but the story in them is what people are buying. Now, there’s an obvious counter to this (I never said my answers are definitive), in that lots of mainstream Hollywood tent pole movies are based of comic books too – the difference here, that comics = art + story, whereas other than the front cover a novel is mostly just story. For me obviously I’m a comic book fan, I just love this medium, but I’m trying to answer the reader’s question. To draw a set of panels does take a lot of time to do, so you’d better make sure you have the story right beforehand otherwise there’s going to be a lot of rework required. That’s not to say that writing the book doesn’t take long, it’s taken me a couple of years to get the story to this point, but I wouldn’t feel comfortable asking an artist to start inking until the whole team had a chance to read and discuss the story several times to make sure we’ve got it right first. We can make changes faster on the story and get to the final output quicker, the artist can then get on with what they do best. that, in my experience, the story and the art inform each other. 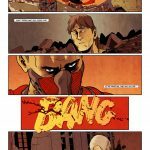 The way the team has worked is that we’ve taken a four stepped approach to making the web comic so far and these four steps have really gotten us to a really amazing comic book. we review the script and discuss whether the story works, i.e. do the actions of the characters move us through the story, we don’t focus so much on panel layout at this stage, we just want to know and I emotionally engaged with the characters.Notice I said ‘characters’ and not ‘plot’, there’s a whole other blog post I can do about the differences between writing ‘characters’ and writing ‘plots’, I’ll let you figure out which is the more important one to focus on. We block out the page, i.e. 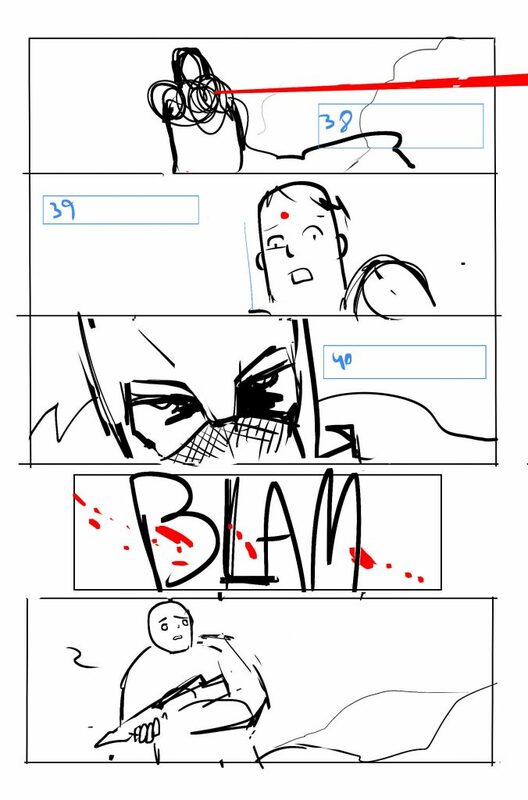 we do low fidelity sketches of the panels to see how the action flows across the page.We know from step 1 that the story itself is working (and if it’s not we would have made changes there and then before getting to this stage. But our focus here is does the page flow? 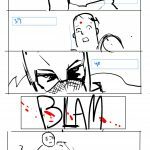 At the end of the day we’re making a comic book so the next level of granularity is whether the page itself flows, now here is the really crucial point, the story flow can change at this stage. What I mean by that is that, it’s more important that the panels work correctly when drawn out than when written out. 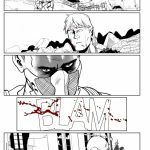 So for example you’ll see below that this page was originally written as eight panels, but when it’s drawn it came out as five panels. We actually contribute to the other parts of the story, so for instance, Seb will take the script page that I’ve written and work independently on the blocking, figuring out if the camera angles I’ve written work or not, whether the poses need to be changed or not and whether the panel count is right or not – these are decisions he’s taking as a storyteller. He’d then feed that back to myself and Simon and we’d iterate on it from there. 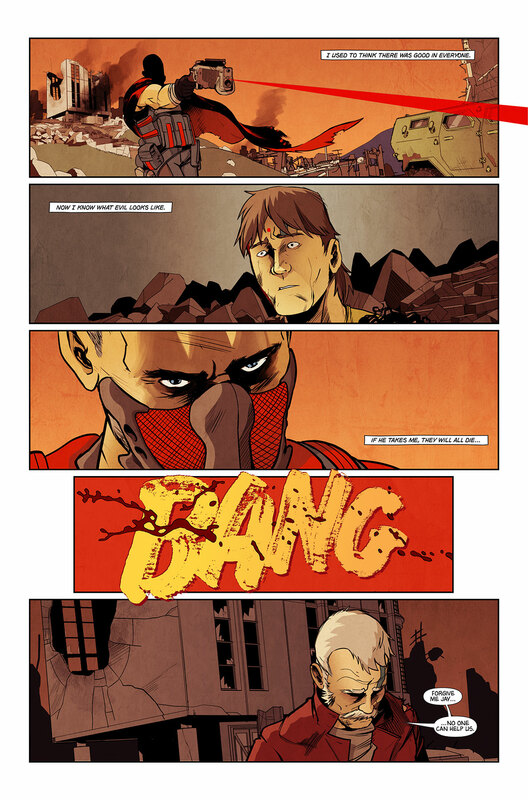 In fact pretty much look back at any of the pages (I put the original blocking and the script in every page) and you’ll see the panel counts from the script to the final page have pretty much changed in all of them – the reason being that the art informs the writing too. We then ink out the pages and add more character and details to the panel – now the next level of granularity is to focus on the individual panel itself – what are the details, the environment, the character expression and poses that come into the panel that weren’t in the original script? The way that the Seb, Simon and I work is that we all see our main jobs as being storytellers, in reality I’m responsible for the story, Seb for the inking and Simon for the colours, we understand that all three elements are important in telling a story. Equally we all know that we’re not confined to just focus on our individual tasks – we’ve split the tasks that way because that’s where our main skill set lies (anyone whose let me loose with a box of crayons and reams of paper will testify to that). Here the art can change the story again. Simon would then be responsible for putting in the right colours for the page, now the choice of colours that Simon makes can radically change the tone of the story.What that means is that though the action and flow may not change but the colour can create a different atmosphere. This in turn changes the way the reader reacts to the story. Simon actually wrote a brilliant blog post on how colour affects story, which you can read on page 4 here. The final stage is to add the lettering – add the lettering, surely this is the most simple stage of the lot?Well again, the story can and in our case has also changed at this stage, as we’ve changed the text whether it’s captions or speech, we’ve made changes here too that have changed the story. The point being to go back to my polite answer above, is that comic books are a real visual medium, and though you can get individual creators who can write, draw and colour, those individuals still have to wear different hats and be a writer and an artist at different times. I think what’s worked so well about this team is that we understand the story is more than just the written script that the story is a combination of all the elements. So tell me, what’s your opinion, do you think that the either the writing or the art are more important elements? I’d love for these posts to be a two way or even multi way conversation about the topic, the best way to make that happen is to put your comments in the comments fields below. 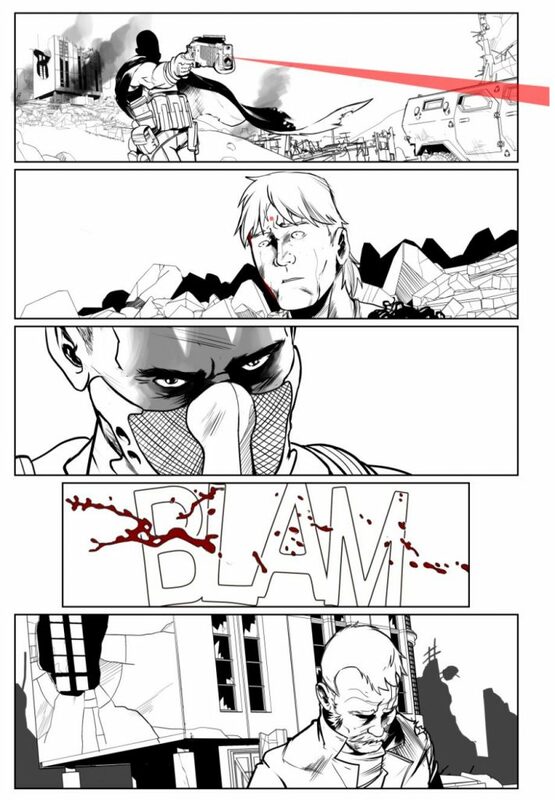 Below is the script, blocking and inking for this page – you can see how the final page (above) has changed from the initial script. laser sight beam hitting between Jay’s eyes. If he takes me, they will all die. C.U. on Jay as he gets covered in blood from one side. Shot of bullet casing hitting the ground &amp; bouncing up. SFX: THUMP – the sound of a body dropping. someone saying a silent prayer of forgiveness. Forgive me Jay, no one can help us. 43. SFX: SOUND OF BULLET FIRE. Thanks for reading, if you’re new here you can go to the first page of the adventure by clicking here. Don’t forget to leave a ‘Like‘ and ‘Comment‘ and if you haven’t already yet ‘Subscribed‘ you can do so with this nifty form below – I’ve got a whole host of exclusive goodies for subscribers that I don’t post anywhere else. *AFF: note both the links above to the two books are Amazon Affiliate links, clearly I’m not writing this blog post to get Amazon affiliate link kickbacks, if you want to click and buy those books through the link I’ve provided it’s up to you, equally if you want to type in the names of the books into Amazon or another book provider that’s equally up to you too – I just had the link so thought it right to let you know that these links do link back to my affiliate account.